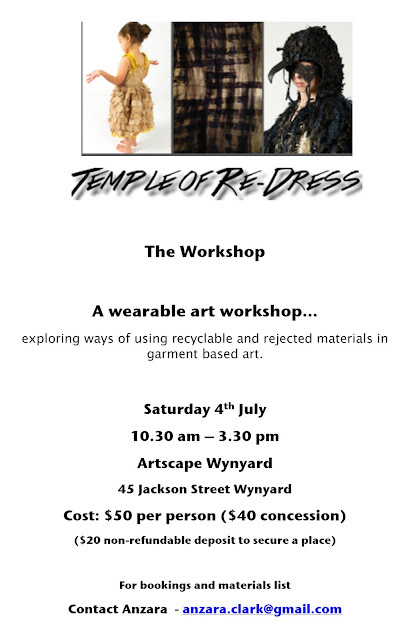 On Friday night was the opening of Anzara Clark's wearable art exhibition Temple of Re-Dress. We and a fantastic turn out and there were many mutterings about how amazing the exhibition was. Thankyou to all that braved the cold and showed their support. The exhibition will be a open for viewing until Thursday 2nd of July - (Closed Sunday/Monday) Tuesday to Saturday* 10am till 2pm. Alongside the exhibition is a workshop hosted by Anzara. Please see the attached poster for more information.